Parenting can be very challenging. Children demand answers to hundreds of questions (daily!). There are social dilemmas for your children that make life stressful. Parents need help sometimes making tough decisions. Friends and family are often very helpful and accessible for advice through a simple phone call, email or Facebook. Sometimes it is nice to bounce ideas off other parents when dropping off or picking the kids up from school. There are other times, a good book can be just what a family needs. This week my daughter was to be the first child in her kindergarten class to share for Show and Tell. She selected the letter D and chose to tell her class about her favorite stuffed pink "Dog" she has had on her bed since she was a baby. We talked about things she could say and questions that might be asked by her friends. She expressed that she was nervous the night before and she talked about how her belly hurt a little on the way to school. Luckily, as we were pulling into the drive at school I had remembered that a few days earlier we had read Nancy Carlson's book, Henry's Show and Tell, a story about Henry and how he was always nervous for Show and Tell until one day he brought in his lizard and it escaped! In all the commotion he forgot about being nervous and was able to tell his friends all about lizards. I said to my daughter as she was getting out of the van, "At least, you aren't showing a lizard like Henry." She laughed remembering the story, "I guess that's why my teacher won't let us bring in animals." Then, she was off to school. After school, she was extremely happy with how things went for Show and Tell. I asked her if any lizards escaped. She replied, "Noooooo. Dad!" and rolled her eyes. Nancy Carlson, is an author and illustrator, of over 60 books for children. Carlson knew as early as kindergarten that she wanted to "make pictures and tell stories." Her website states that her childhood was "happy and fulfilling", which can also be said about her books. Many of her books reflect experiences she had when she was younger, like dealing bullies or stage fright. Carlson's goal is to communicate a message to her readers that doesn't come off as "preachy" but more as a "gentle reminder of what is right." My daughter's favorite book this week was Louanne Pig in Witch Lady , about a misunderstood elderly lady on the street that ended up being nicer than everyone expected. My son's favorite book was Smile a Lot! which presents many scenarios on how smiling can help make things better. I also chose Smile a Lot as my favorite this week and decided to make a book with my children about things that make them smile. 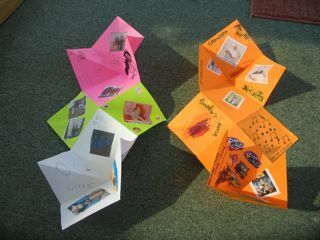 We made a slightly complicated, yet very cool Exploding Book (here is another link) to hold all of our happy things! 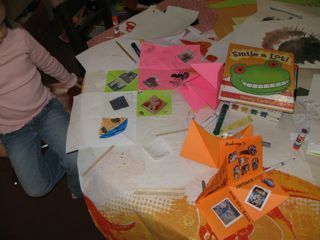 We used stickers, printed photos, and drew pictures to fill the ten squares in our exploding book. I anticipated some difficulty in generating ideas. Therefore, I wrote some idea starters on popsicle sticks. This worked great when my daughter said, "I don't know anything else that makes me smile." I offered her a popsicle stick and she was able to continue with her book. I wrote ideas like, nature, places to go, friends, family, food, by yourself, and neighborhood on individual sticks. These words were able to generate ideas like birds, beach, playing star wars guys, and the neighbor's dog as things that make us smile. Every year for my birthday , since I have been an adult, I either go for a long hike or bike ride. October 10th here is Minnesota is usually really nice...but last year it snowed so no bike ride! Then for dinner I always go with my kids to a family restaurant where I used to work as an art student. I always order Swedish meatball and mashpotatoes! I am 100% Swedish so it is my dream meal! Then I top it off with pie! The best part is I am with my kids and it is a chance to catch up with them! My best birthday as a little kids was my 10th and all my friends gave me a troll doll. I just remember opening every present and each was a troll..which I really really wanted. I played with those trolls for years! I like my birthday but don't make a big deal about it outside my family. I also like it that my birthday is in the fall which is my favorite time of year. Thank you Nancy for sharing your birthday traditions and memory! We loved reading your books this week! I have really enjoyed following you on Facebook and Twitter too! The daily doodles are great!